Until there is a cure we need programs that support people living with dementia and their care partners. Every 67 seconds someone in the United States develops dementia, over 5 million Americans are living with dementia today. This is expected to grow by 40% in the next ten years! This disease touches all of us. The Connected Horse workshops provide the opportunity for people living with early stage dementia and their care partners to be together as they experience non riding activities with horses. The bonding among horses and participants is immediately evident as participants and horses interact over the fence. It is so amazing. Horse have the ability to sense our emotions and mirror them for us. The relationships and understandings deepen quickly. Our gifted facilitators help participants reflect on the experience and individual learning intentions. 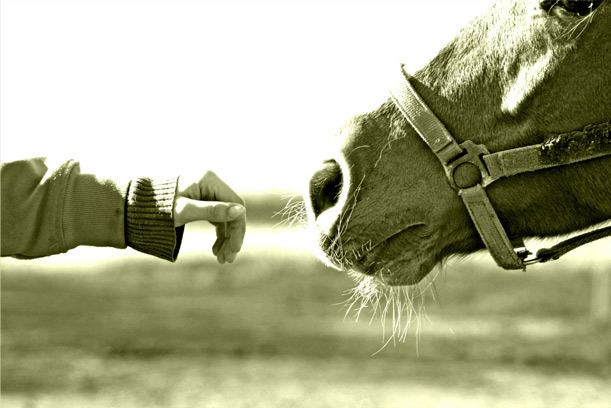 The power of the human-horse connection helps participants not only feel relaxed, confident and happy in the moment, they also learn about self compassion, stress reduction strategies and communication and awareness practices. The story of Maria and Axle is one that warms our hearts and shows the power of connection. We have all heard the saying "The eyes are the windows to the soul". When these two looked each other in the eye something magical happened. A quiet woman who was an advocate for the underserved until she was forced to retire because of the effects of her dementia, slowly walked toward the barn with her care partner. The large bay horse popped his head over the stall door to greet the strangers. Now close your eyes and imagine this. As she approaches this horse at least 10 times her weight, he looks at her, she looks at him. The facilitator who knows the power of the human-horse connection, brings them closer. Only a few steps each and they are face to face, he slowly leans sideways to rest his head on her shoulder, and breathes. It is silent. She is motionless. And then, she smiles and for that moment it is okay that she can no longer speak. Pure joy fills the barn. We need your support to help us expand these workshops throughout California, and the country. Connected Horse gave Mom and I so much; I'm glad to give some back so others can have this amazing experience! This is an organization with heart and so much hope for those whose lives they touch. My wife and I are grateful for the personal experiences we have enjoyed during the development phase of the programme. Thank you Nancy and Paula for the important work you are doing and for all the lives you are touching. It is an honor to participate in any project in which Nancy Schier Anselmo participates. For the wonderful work Connected Horse is doing to Help people with Dementia. A wonderful program that is enriching the lives of those who suffer from memory loss and want to this opportunity offered to more families. I have witnessed the miracle of this program. It touches hearts of all involved. This is such a wonderful program! I encourage you to donate today so more participants can have this experience. I'm honored to contribute and thankful for my association with Nancy Schier Anzelmo, whose passion never tires in the work of dementia care. Connected Horse helps people on the journey of living for the future! What a beautiful project allowing horses to bring a healing dimension into the lives of people facing a future with dementia. Such wonderful work you are doing. Wishing you the best in 2017. It's a joy to support the meaningful work of my dear friend, Nancy Schier Anzelmo. This program gives hope and happiness to many families!